I just performed the ultimate leak test, by accident. I had the dish installed shortly after leaving the country, so the first 1 3/4 months the modem had nothing connected to it. I returned to the US on the 20th with 8 days left in the billing cycle. When I connected the computer for the first time I brought up the System Control Center and 10% of the monthly data had been used during those 3 weeks. So over a full month 2.5 GB's sucked out doing nothing. Just to be clear, during this time no devices connected to the modem. How can this get fixed so I am not losing 13% of the monthly allowance for nothing? Though your inadvertent experiment would seem to point to an issue, it doesn't really help to point to the cause. To determine where the data "leak" issue may lie, please perform the modem isolation test as outlined below. Regarding overhead data, the amount used is normally tiny. Though very unlikely, if there is a problem with overhead data, such as an excessive amount being used and/or it being deducted from your own data, this test will help to establish such. 4: Leave the LAN cable disconnected from the modem for several hours. 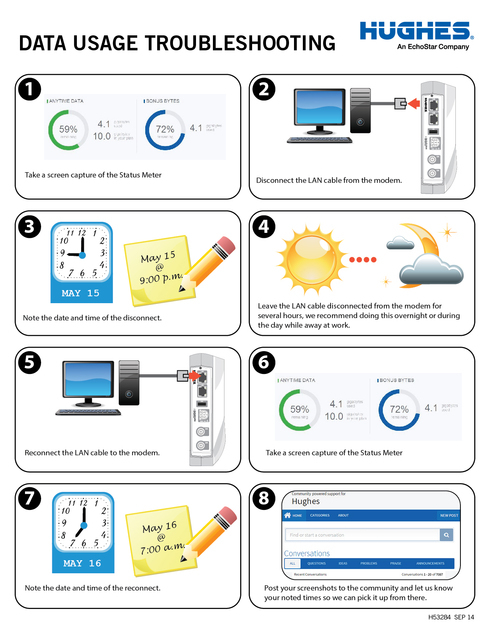 HughesNet recommends doing this overnight, or during the day while at work. DO NOT unplug the modem from the power. The modem must remain powered. Please be aware that, if you downloaded any large files just prior to this test, or if the disconnect was for an extensive time period, some usage may appear to have occurred, but it should be rather negligible. That is exactly what was done. There were no connections of any sort for 3 weeks of that month. The 2 GB used up during that 3 weeks (~2.5 over a full month) is purely modem overhead or inaccurate metering. The tests need to be run as laid out. Though it may seem that this is, more or less, what occured, the reps/engineers need the test to be performed as instructed and the information given that is requested in those instructions in order to be able to help you. So then 12% data mismetering is just dismissed even though its quite easy for Hughes to see that there were no connections during that 3 week period. No, it is not dismissed. If it were, no one would bother taking the time to help you. As I said, the test will determine whether the issue is on your end or HughesNet's end. The test is the troubleshooting step that is necessary to move on to solving the issue. No one is going to twist your arm to do the necessary troubleshooting, which is the modem isolation test. Either you will or you won't. However, if you'd like to get the issue resolved I suggest you do. Thank you for posting. After reviewing your account, we found there was usage earlier this month from a device with a MAC address ending in ef:0a:c6. Also, your wifi networks are unsecured, leaving them open to any wifi device that may come within range. I highly suggest password protecting your wifi networks to avoid any other unwanted wireless devices from connecting to your network and using your data allowance. I prematurely sent a replacement modem before digging deeper and learning how your data was used. You'll receive a new modem in a few days, so feel free to return it using the return label in the outer pouch. I'm sorry for any inconvenience that may cause. Our community has recommended GlassWire, which is a 3rd party program that tracks what connects to your network and shows exactly how much data is used. it would be a good idea to check it out so you have another way to track and manage your data. My apologies. I had mistakenly assumed by your reply to me that your WiFi had been disabled, which is why I was insistent that the test be performed. Damian has the ability to see that it wasn't. I defer to him, of course. Open WiFi is never a good idea, no matter how remote the location might be. Wifi was unsecured only from the 20th on. Prior to that it was secured. I live in an extremely remote location. Its a 10 mile snowmachine ride in in the winter.